Shipping Your Unit According to your facility requirements. ﻿We ship﻿ hundreds of units a year and will make arrangements for the lowest cost delivery possible for your new unit. Loading dock delivery or off loading with your fork-lift will be least expensive. Residential delivery is a term and fee used by freight carriers to describe delivery to any address which is not zoned commercial. A lift-gate is a used to raise and lower items from the bed on a tractor trailer. Required if you do not have a loading dock. 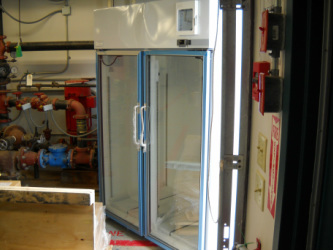 White Glove deliveries can add extra time for delivery after your new freezer ships from our facilities. This is for the time it can take to make arrangements for local delivery. 1. Normal Freight Delivery - will have no additional charges or fees. In normal Freight Delivery, freight companies deliver our freezers on a tractor trailer which is 56 inches above the ground and that are designed to load and unload at a loading dock - or with a fork-lift. 2. Lift gate delivery - If your delivery location does not have a loading dock or fork-lift and the item is too heavy to remove from the trailer by hand, you will need to remove them from the truck by yourself – the driver will NOT be obliged to help! The average cost of a lift-gate is as much as $80-100 more than the basic (loading dock delivery) charge. A lift-gate is a used to raise and lower items from ground level to the level of the bed on a tractor trailer. 3. 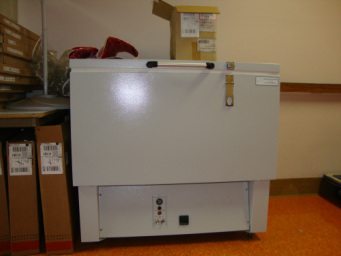 White Glove Delivery - can take up to 10 business days for delivery after your new freezer ships from our facilities. This is the amount of time it can take to make proper arrangements for the delivery from the nearest carrier terminal to you and is added to the time it takes to ship. The actual Trucking Company that will be delivering your unit will call you to schedule an appointment for delivery. Final arrangements for delivery will be made directly with the actual carrier, not with IDS. We will put them in touch with you for scheduling. Two men, driver and helper, will arrive at the appointed time. The driver and helper will make the delivery in the Trucking Company vehicle, which will include a lift gate. Your new freezer will be brought to the room (no stairs, ground level, unless otherwise planned) and remove the unit from the packing. No debris will be left behind. At time of delivery and before the drivers leave, review the check sheet and completely fill out on how the the delivery was performed. Any damage or anything not as promised or anything you did not like about the delivery will need to be noted on this check list. If you check and initial everything with no notes, you are stating that the freezer was received with no damage and no claims can be filed. Residential delivery is a term and fee used by freight carriers to describe delivery to any address which is not zoned commercial. Usually a home, but it could be a church, farm community center etc. Businesses run from a home are considered residential. Average delivery fee can be around $75 in addition to other shipping rates, including the additional lift-gate usually required. ﻿Step 1: Note Damage With The Delivery Driver. Step 2: Take pictures of the damage and retain all original packaging. Step 3: Contact IDS, or contact your freight company if you arranged for shipping. Every freight shipment is insured, but in order to collect the insurance on any damaged goods, YOU must inspect the shipment before signing for it! Legally, when the manufacturer signs over the unit to the freight company, they own it. "What should I look for when inspecting my shipment?" Be sure to inspect your item when it arrives. Pay special attention to holes poked in the packaging and inspect for dents or crushed corners. If you see anything suspicious, remove the packaging and inspect the item. If you sign your Freight bill free of any claims, you may have little recourse if you discover it is damaged. When you receive the item and sign for it, you own it. Therefore, you should always carefully inspect your shipment for any damage. If there is any damage at all you must note the damage on the freight bill. This is the only way you will be compensated for the damage. NOTE DAMAGE WITH THE DRIVER. "What if my unit is damaged?" You can note damage on the freight bill and accept items anyway. Many times damage is cosmetic. Ask the driver to inspect the damage with you and note the damage when signing for delivery. If it is something you can work with, or your need for the freezer outweighs the damage - then sign for the unit. If the damage is obviously bad, and you know you want the unit replaced we suggest you refuse the delivery. Regardless of your choice, note all damage with the driver. "What if my item is damaged and I Already Signed?" If you sign the freight bill and do not note damage, the freight company will only replace your item, approve reimbursement for parts and repair, or provide compensation of "Hidden Damage" upon an inspection. Retain all original packaging material and schedule with the freight company for them to come and inspect. Follow all of the same instructions above, and keep the package as packed up as possible. Take pictures from different angles of the item and the packaging, and save all packaging material. If you refuse the shipment because of damage, it will be returned to the factory and we will ship a replacement as soon as possible. If there is no damage on the unit and it is refused, your company may be responsible for freight costs. No freezer may be returned without prior authorization from IDS and the manufacturer, and an RMA# is issued to authorize the return. The process to provide a replacement may take time, due to stocking issues, build times and transit times. This is usually the best option if it is obvious to you that your shipment is damaged beyond repair. All IDS Freezers are built for the order. They are not warehoused. These are considered "Non-Stock" items and we do our best to make sure the customer has decided on the product before we start the build. Returns are not common, and we suggest approaching the purchase of an IDS freezer with that in mind..
Products must be unused and returned in the original packaging within 30 days from ship date. No product is accepted without prior authorization. Any shipment that arrives at an IDS facility collect or without an RMA will be returned to the sender at their expense. CONTACT IDS TO REQUEST THE RETURN. A restocking fee of 25% will be assessed for all returns, or more than 25% based on the condition of the return. Customer will be notified before any credit is given and may elect to have items returned to the customer at his or her expense. No return will be accepted without an RMA number issued by IDS. Number must be displayed on the outside of the original box. Unless pre-arranged, all products will be returned to IDS. Any item or product being returned by a customer that is unusable because item or product fails to meet specifications or has a defect in manufacturing would be repaired or replaced under warranty for that product at the discretion of the manufacturer - not returned. IDS does not offer to indemnify the customer for any costs related to IDS equipment performance. All related shipping costs are paid for by the customer. Specifications on the website are subject to change at any time. Still have questions? Give us a call right away!